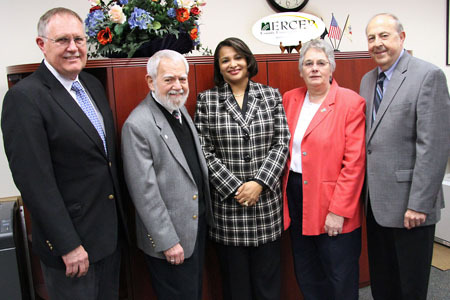 West Windsor, N.J. - MCCC's Professors Emeriti Association recently announced the election of two of its members to leadership posts. Retired Vice President for Academic Affairs Dr. Thomas Wilfrid was elected president of the association. Serving as the new vice president is retired Engineering Technology Programs Coordinator John Santosuosso. This dedicated organization of retired professors supports the college by awarding annual scholarships to outstanding continuing students. Currently numbering 65 retired faculty members, the association awarded scholarships to five high-achieving students in 2011-12. The group has doubled that number to ten students for the 2012-13 academic year. Dr. Wilfrid began his career at MCCC in 1969 as an instructor of physics and mathematics and continued teaching part-time during thirty-five years in administrative positions, which included fifteen years as the college's chief academic officer and a total of two years as acting administrator/acting president of the college. He retired in 2007 to become executive director of the Princeton-based Charlotte W. Newcombe Foundation. Pictured are Dr. Thomas Wilfrid, the new president of the MCCC Professors Emeriti Association (far left ) and John Santusuosso, the new vice president (far right). They are pictured with, second from left to right, former Association President Charles Prettyman, MCCC Vice President for College Advancement Dr. Mellissia Zanjani, and former Association Vice President Jennifer Dowd. Prof. Santosuosso taught Civil Engineering Technology full-time from 1968 until 2004, including several years as chair of the former Engineering Technology department. He continues to serve the college as a part-time student academic advisor in Enrollment Services. The new officers assume the association's leadership from Charles Prettyman, who served as president since 2004, and Jennifer Dowd, who served as vice president since 2006. Prettyman began his MCCC career in 1969 and retired as a professor of Information Systems/Computer Systems and Networking Technology in 2002. Dowd served as director of financial aid beginning in 1969, and later served as assistant dean for human resources before joining the faculty; she retired as a professor of business in 2005. Says Dr. Wilfrid, "It is an honor for John and me to follow Chuck and Jennifer in these roles. As officers of the Emeriti Association, each has provided exemplary service to the college, its students, and to former colleagues. They have set a wonderful example for John and me to follow."